Our calendars will help you on your way! Today, we excel at calendars, printing them without a glitch and at the sharpest prices. Use our software to personalise your own calendar and treat employees and customers to a little year-round reminder of your services. Magnificent table tops, efficient monthly and yearly calendars, little timers. We have everything on board to make your calendar wish come true. While all our calendars are in the B2B market, one is the exception. The Druivelaar is ubiquitous in just about every Flemish interior: a simple tear-off calendar with quirky quotes and titbits at the back of every page. 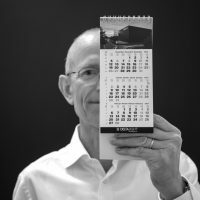 INNI has published this renowned calendar since 1940, but we’ve gone way beyond our original format since then.